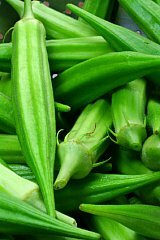 Okra facts, an information sheet for kids cooking activities. Okra facts and general information about okra. Okra grow as a seedpod in a plant. Choose small pods the size of a finger. Store in fridge crisper drawer and use within one-two days. Okra are high in fiber, Vitamin A, Vitamin K, Vitamin C and Vitamin B6. Fry Okra, tomato, and onion with a little butter in a skillet and serve as a side dish with chicken. In a skillet, saute chopped onions for several minutes. Add meat strips and cook until no longer pink. Add in sliced okra and peppers and cook several minutes until vegetables are tender. In a separate bowl, blend teriyaki sauce with cornstarch. Blend together and add into your skillet. Continue to cook until sauce thickens. If you'd like more sauce go ahead and add more teriyaki sauce. Serve over cooked rice.